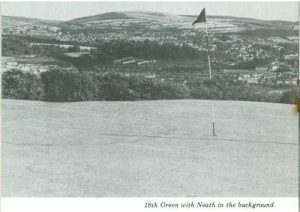 Behind the formation of the Neath Golf Club, and the construction of a course and clubhouse worthy of the ancient borough, lies a story of great endeavour and perseverance in the overcoming of obstacles. At the outset, particular mention should be made of its pioneer founder Mr. M. H Daniel. It was he who saw the necessity for a golf club in Neath, and it was he who had the courage to put his ideas into practice. 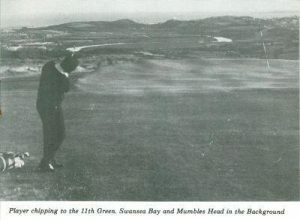 For twenty two years he had been a member of the Swansea Bay Golf Club, and he realised the serious obstacle that presented itself to the youth of the town when the club and the course were situated some miles away. Thus he conceived the idea of forming a club in Neath and after making a personal canvass of many townspeople, a meeting was called at the Neath public library on July 18th 1933,and there a committee was appointed to further examine the proposal of forming a club. At this critical period in its formation, the club was extremely fortunate in receiving the support of Mr. A. J. Morris, who became the first chairman. His genius for organisation and keen business acumen were invaluable assets, and his name will stand out as one of the clubs most energetic and generous founders. His was not a passive interest, but a wholehearted enthusiasm, and not only did he work unceasingly for the success of the club, but also contributed generously to its finances. Just as he has helped in other fields of sport, he assured the success of the Neath Golf Club by his great interest and endeavours. About two months later, on September 11th, the committee reported their findings at another well attended public meeting, held at the Neath Public Library. The report showed that great strides had been made, and that the services of Mr. Hummble, the Llandrindod professional, had been acquired, and a suitable site at Glannant, Cimla, had been inspected. Negotiations had been made for the procuring of the land, which would be excellent for a nine hole course. It was at this meeting that the officers of the club were elected, and the appointments were as follows: Mr D. M. Evans-Bevan J.P., President: Mr Jonah Arnold J.P., and Mr. George F. Hern, Vice Presidents: Mr. A. J. Morris M.B.E Chairman: Mr. D. R. Jones Treasurer: and Mr. M. H Daniel, Secretary. It seemed, after that meeting, that the stage was set for carrying out the work of construction and it was anticipated that the course would be open in the spring of 1934. The greatest setback of all, however was yet to come. The negotiation for the acquiring of the Glannant site fell through, bringing the committee to a deadlock. They endeavoured to acquire a portion of the Gnoll estate which covers a wide area, but the town council refused their application. Thus it appeared that all plans for forming a golf club at Neath must fall through, but this was not so. Every member of the committee was enthusiastic, and the untiring secretary refused to accept defeat. He searched the country side around Neath for a suitable site, and having inspected land on the parson’s folly side, eventually found the ideal site at Gellia Farm, Cadoxton. Having made the necessary enquiries, another public meeting was called at the Neath Rural District Council Chamber on April 28th 1934. The attendance at that meeting was more than encouraging and the report from the committee that a site large enough for an eighteen-hole course was available, was received with acclamation. It was unanimously decided to carry on with the work, and was agreed to have the course planned and inspected by Mr. James Braid, The Open Golf Champion from Walton Heath. From that time on tremendous progress was made. Unhindered by any serious obstacles, the committee worked unceasingly to accomplish their task. On May 14th and 15th 1934, Mr James Braid, who is recognised as the finest golf course architects in the country visited the site at Gellia, and he planned the course and expressed the greatest satisfaction at the site selected. He described the course thus: “It is a first class course, ideally situated. I consider that the condition is excellent and the course is nicely undulating without being too severe. It was on July 18th, that the next public meeting was held, and it was then decided to erect the club house at a cost of £1,800. The funds of the club at that time did not permit the expenditure, but the enthusiasm of the members, of whom there were about 200, overcame that difficulty. Schemes for the raising of the funds were put into operation, and by the generosity of the members sufficient money was obtained. At this juncture mention should be made of the extreme munificence of the Club’s President, Mr. D. M. Evans-Bevan J.P. for, not only did he make a gift of £262.10s.0d to the Club, he also undertook to fit out the lounge and the bar of the clubhouse, and vouched for it being as well equipped as any club in Wales. The organisation of functions during the winter months for the raising of funds was suggested, and a great eagerness to co-operate in the furtherance of the clubs welfare was evident among the members. During the winter the proposed functions were organised, and by the spring of this year the club was in a flourishing state. Tremendous progress had been made on the course, membership had reached a satisfactory number, and the club had commenced to become a fixed institution of the town. On to the present day where the committee are just as determined and active as their predecessors, and the membership has steadily grown to a healthy figure. The Course itself has become famous for its natural beauty. Walking over it is an undiluted pleasure. Magnificent views of mountain and vale abound on every hand. Looking back towards Neath the eye is caught by the ribbon like appearance of the river winding its way to the sea, and on a clear day the Somerset and North Devon coast can be discerned. 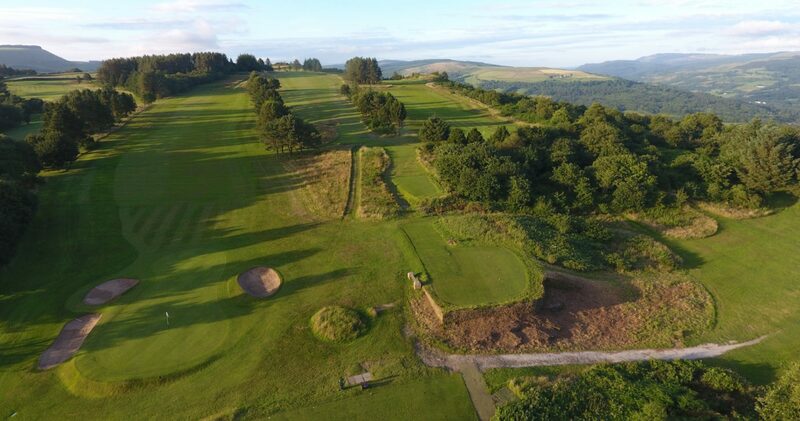 Looking westward, range rises after range to the limit of the Black Mountains in Carmarthenshire, and in one place, near the tenth tee, what is probably the most magnificent view of all is obtained. From this vantage point, some 600ft above sea level, it is possible to trace the Neath and Dulais Valleys from Llantwit and Resolven, Cefn Coed and Crynant, as far as the Brecon Beacons.